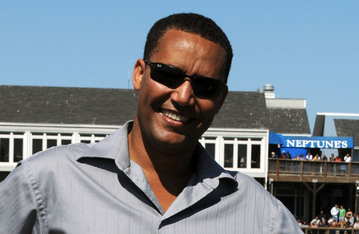 Dr. Zeresenay Alemseged, Director and Curator of the Department of Anthropology at the California Academy of Sciences. (Courtesy photograph). New York (TADIAS) – You may have noticed the recent news coverage of an anthropological discovery in Ethiopia. The journal Science published a collection of eleven papers explaining the findings of an international group of scientists regarding the bones of a human-like species named Ardi, short for Ardipithecus ramidus, who roamed the Earth 4.4 million years ago. The researchers concluded that Ardi is now the oldest known fossil of human ancestor; effectively unseating the famous 3.2 million years old Lucy (Dinqnesh) — whose skeletal remains are currently touring the United States. In order to understand the meaning of this new discovery, we contacted Dr. Zeresenay (Zeray) Alemseged, the paleoanthropologist who discovered the 3-year-old Selam (nicknamed Lucy’s baby), a fossilized skull and other bones of a female child australopithecus afarensis, which is estimated to have lived 3.3 million years ago in Dikika, Ethiopia. The bones were found in 2000. TADIAS: Dr. Zeresenay, thank you so much for your time. Zeresenay Alemseged: It is my pleasure and thanks for the invitation. TADIAS: We wanted to ask you few questions about the newly famous Ardi bones from Ethiopia. They are said to be much older than Lucy. How significant is the new discovery in terms of our understanding of human origins? Zeresenay: The discovery is very significant and I would like to commend the discoverers and their leader Prof. White on their hard work both in the field and in the laboratory. I know first hand how exigent this endeavor is. After many years of painstaking process, they have provided us with a lot of new information about Ardipithecus ramidus, which existed 4.4 million years ago. This means that it predates the Lucy group (genus) known as Australopithecus by 200, 000 years, since the earliest representatives of Australopithecus are dated back to 4.2 million. If you were comparing individuals however, the difference would be 1.2 million years. TADIAS: Some anthropologists are now humorlessly referring to Lucy as the “former First Lady Australopithecine.” Is that a fair description in light of Ardi’s discovery? Zeresenay: I also find this remark amusing. When I announced the discovery of Selam in 2006, journalists had asked me the same question, because Selam is 150,000 years older and more complete than Lucy. My answer was no and still is with the discovery of Ardi. Each of these finds is a great source of scientific information, national pride and heritage for humanity. These skeletons are so rare that each contributes uniquely to answering questions as to what makes us human and how we became who we are. One can not replace the other. Lucy continues to play a comparative role when new fossils are discovered. If some are saying this in reference to the age difference, then Ardi is not the earliest human fossil either; we have fossils that are about 2 million years older than Ardi from Chad, Kenya and Ethiopia. TADIAS: Can you describe to us the difference between Lucy, Selam, the one discovered by your team, and Ardi? Zeresenay: What they have in common is that they are all remains of female individuals. The three of them were small-brained, lived in woodland environments, did not make stone tools and were all discovered in Ethiopia, which shows that indeed this country is not only the cradle of mankind but also home to the three most spectacular fossils. But they differ also. Lucy lived about 3.2 million years ago and is an adult who belongs to a species known as Australopithecus afarensis. Because 40 % of her skeleton was recovered, she has played a critical role in helping us answer questions related to body size, stature, differences among males and females and how this ancient species moved around. 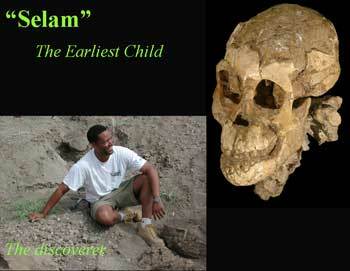 Selam also belongs to Australopithecus afarensis, a species that researchers think is our direct ancestor. She lived about 3.4 million years ago and over 60% of her skeleton, including an intact skull and face, has been recovered; what is most extraordinary about her is that this skeleton belongs to a 3-year-old child, and finding fossil children is extremely rare. By looking at her still developing skeleton, teeth and brain, one can investigate issues pertaining to growth rate, maturity time, how the brain developed etc. Selam even helps us to ponder the type of voice produced by her species. Ardi is a partial skeleton including the crushed skull of an adult individual and belongs to Ardipithecus ramidus, a species first named in 1994. She dates back to 4.4 million years ago and preserves characters that show that she walked upright like Lucy and Selam but also climbed trees. Important questions pertaining to the social behavior of early hominins have also been addressed based on this fossil. Ardi also shows that the earliest hominins were not necessarily chimpanzee-like. We have learned a great deal about human evolution in general from Ardi, Lucy and Selam. In short the three fossils are great Ethiopian fossils contributing uniquely to science. Zeresenay: Anthropological sites in the Afar region and the southern continuation of the Ethiopian Rift to the Omo Valley represent “hotspots” for paleoanthropological studies. Ardi, Selam and Lucy, many extinct hominin species, a huge number of non-human animal fossils and primitive stone tools come from the Afar and other localities around the Omo River in the South. The earliest known Homo sapiens (modern human beings, very much like you and me), dated back to 195, 000 years ago, come from a site called Kibish in Southern Ethiopia. These finds are still ancient, but come from a much later time than do Selam and Lucy. Younger H. sapiens remains dated to 160, 000 years ago were also discovered at Herto in the Afar. Furthermore, DNA evidence shows that every human being living in any part of our planet today can trace back his or her ancestry to a woman who lived somewhere in southern Ethiopia 100,000 years ago. Combining the fossil and genetic evidence we can say that we all are Africans and our ancestors probably came from the present day Ethiopia, hence we are all Ethiopians. TADIAS: How does the new discovery further explain the ancestral chain? Zeresenay: The ancestral chain of humans is still being explored and each fossil discovery contributes to fill in a gap in our understanding of the family tree and its different stages. Particularly when you find remains, like Ardi, that are comprised of skeletal elements from the same individual, you are able to look into questions related to limb proportion, stature, body mass etc., which you can not do if you only have fragmentary fossils. Additional significance of the new find emanates from the potential contribution it could make to bridging the knowledge gap between the earliest known human ancestors, such as Sahelanthropus tchadensis (Toumai) and Australopithecus. The new discovery is not the earliest human ancestor known today, since we have Toumai from Chad dated to 6.5 million years, but Ardi’s discoverers suggest that she sheds some fresh light on what the common ancestor of humans and chimpanzees might have looked like. She also helps explain questions related to the mode of locomotion and behavior of early hominins among others. TADIAS: What are some questions that we are still longing to answer? Missing links? Zeresenay: Over the past three decades, tremendous progress has been made in the field of paleoanthropology. We know that the very first upright walking human ancestors emerged around 6-7 million years ago, the Lucy group appeared just before 4 million years ago, and Homo sapiens emerged only 200,000 years ago. We know that the earliest technology, in the form of stone tools, appeared just over 2.5 million years ago, that most of our evolution took place in Africa, and that human ancestors left Africa for the first time only 2 million years ago. So we have answered many important questions. Only fifty years ago, this knowledge did not exist and it would have been unthinkable for many to see Africa as the birthplace of humanity. Yet, scientific research is a living and dynamic process and new answers spark additional questions. Accordingly, there are many outstanding questions in our field today. First, though we have a reasonably well-established record of the human fossil record the dearth of information on the chimp line is frustrating. Secondly, we do not have solid evidence on what the common ancestor of humans and chimps looked like. Third we do not know much about the babies of these ancient species because they are missing from the fossil record; Selam helps a lot in this regard, but we need more. Fourth, the link between Australopithecus and our genus, Homo, and that between Australopithecus and earlier species is not clearly established. These are among the major issues for which we need further data. TADIAS: Is there anything else you would like to share with the Tadias audience? Zeresenay: Ethiopia/Africa is where humanity originated! This was established scientifically. I take tremendous pride in being part of the scientific process that demonstrated this, yet I wonder if we can make this place not just the origin of humanity but also a place where humanity thrives? My answer is a resounding YES! Let me speak a bit beyond the realm of my specific expertise and touch on the scientific process in general. Science changed and will change the world! Suffice to reflect for two minutes on the number of scientific achievements made between 1909 and 2009, and their impact. Science is all about asking a question (often out of curiosity), acquiring tangible data and trying to answer it. This simple logic is applicable to many aspects of our lives. We know the many difficulties our nation and Africa in general are faced with and I am strongly convinced that whatever we do in life, wherever we are and whatever our aspirations and opinions are, if we all attempt to reason based on what is OBSERVABLE to the best of our abilities then we would have contributed enormously to the betterment of our nation, continent and humanity. TADIAS: Thank you so much again for your time, and we wish you all the best. Dr. Zeresenay: You are most welcome and thanks for letting me share my views with your audience. A great interview. What is fascinating about the interview is not only the new information we learned about the beginnings and evolution of human beings in Ethiopia in particular and Africa in general, but also the fact that among the generators of the scientific paleoanthropological information are outstanding Ethiopian scientists such as Dr. Zeresenay Alemseged. This is a very informative and educational interview. I was specially fascinated by Dr. Zeresenay’s explanations not only about the fossil but also the DNA evidence: “DNA evidence shows that every human being living in any part of our planet today can trace back his or her ancestry to a woman who lived somewhere in southern Ethiopia 100,000 years ago.” When you stop to think about it, this is mind blowing. Now, only if we can figure it out why we remained behind in the so many ways compare to many other countries, even though we have been around much longer than all of them. Thank you Dr. Zeresani for the information and thank you Liben Eabisa and Tadias for well prepared questions. What made me truly happy about this interview is to watch two fellow Ethiopians (a journalist and an expert) hold such a thoughtful and well informed discussion on major global news of our day. Proud of you and please, please keep this up! I would like say from the bottom my heart that i really appreciate your work, and would like to keep in touch with you. I am a third year student of Antropology. Just wanted to say what an informative and pleasing conversation with Dr. Zeresenay Alemseged. Thank you a million Tadias. You guys are doing a fantastic job! How do scientists test the bones for their exact age? If all human beings are from the same human ancestor why so many discrepancies in human looks?